Getting an home carer may be an option for you if you're struggling to do everyday tasks such as getting dressed and washing yourself but don't feel ready to move into a nursing home. Hiring a home carer can allow you to retain a degree of independence as you can remain in the comfort of your own home. How Can a Home Carer Help Me? A home carer can be invaluable for helping you to complete the kind of activities that most people take for granted, such as dressing yourself, washing yourself, getting meals ready, doing household chores and going to the toilet. 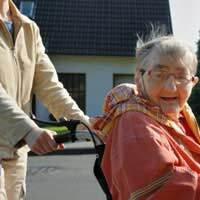 If general mobility is a problem, a home carer may also perform tasks such as doing your food shopping for you or driving you to appointments. For home carers that have nursing qualifications and experience, they can also give injections or change catheters. There are several options for hiring a home carer. The first involves using the social services department of your local council, who can take control of the entire process. An initial health and social care assessment with your local social services department will get the ball rolling and your specific needs will be assessed to determine the extent of the care and support that you'll require. If approved, direct payments that are in line with your care needs can be set up and this gives you the opportunity to find and pay for your own home carer rather than having to accept the choice offered by your local social services department. Alternatively, you may prefer to go through a care agency to find a suitable home carer. You'll be required to pay the care agency but the home carer will be employed by them and isn't your responsibility. Home care agencies are regulated by the Care Quality Commission, which guarantees that home carers hired through them will meet at least the minimum standards of service. You can use the United Kingdom Home Care Association website to find home care agencies that are close to you. If neither of these options appeals, you can take complete control in the hiring process and find a home carer on your own terms but this means that you'll have to take on employer responsibilities such as dealing with tax and insurance and conduct interviews with the potential candidates who respond to your job advert. If you're not in a position to do this, brief a friend or family member on what you're looking and have them conduct the interview on your behalf. It's useful to have a friend or relative sitting in on the interviews even if you intend to conduct them yourself as they can offer feedback on the candidates. If you opt to find a home carer by yourself, writing a job description that provides an outline of your average day and the tasks that you need help with can be a useful way to find a home carer as this gives the care agency more information to use when matching you up with one. If you'll require a home carer to possess specific qualifications or skills (for example, nursing credentials for giving injections or changing a catheter or a full driving licence for acting as a chauffeur to and from appointments), mention this in the job description too. Good places to showcase your job adverts include your local Jobcentre, supermarkets and convenience stores. Once you've selected a candidate after the interview process, request references from previous employers to check their credentials. The ideal candidate will have previously acted as a home carer so that you can request this reference from a previous employer. As your home carer will be working in your home, you may want to look into having a police check carried out on your behalf to double check his or her background. The social services department of your local council can put in a request to the Criminal Records Bureau on your behalf.